“Rajanigandha flowers have good demand for preparing garlands at the time of festival and family functions. As nobody in my village was cultivating this flower I thought to experiment and be first to grow it,” says Mr. Adappa Sugoor, farmer from Sultanpur village, Raichur district, Karnataka. 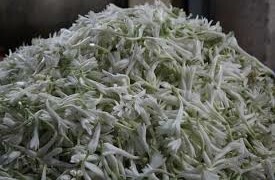 He was first introduced to Rajanigandha (also called as Tuberose or Sugandaraja) flower in 2015 by one his friend from other village who was growing the same flower commercially. Since then Mr. Adappa is earning good income from this crop. Along with rajanigandha in 1.25 acre he is also growing two more flowers namely kanakambara and marigold in open cultivation. “Only on insistence of my friend Mr. Shivanna I stepped into the cultivation of this flower. As it was a new crop in our region, entire know-how and planting material was provided by my friend. I followed his advice and got good yield. As a result I was able to get an average yield of 10 kg flowers every day for two years. Presently the flower yield has dropped to 6-7 kg/day due to water scarcity but during monsoon I am expecting flower production to increase to 15 kg/day,” he shares. The initial investment of rajanigandha plantation was Rs. 50 thousand then after it was no expenses. It included purchase of planting material, the bulbs that cost him Rs. 270 for a 50kg bag. He bought 9 bags. The bulbs were planted 3.5 feet apart row to row and 9 inch bulb-bulb. Additionally he has planted 240 fig plants as intercrops, “I have planted 1 fig plant in every 3rd row of rajanigandha,” he says. Plants are watered once in 4days for 2hours through inline drips. The soil is treated before transplanting the bulbs with 4-8 ol to avoid white ants in the soil. No manure is fed in the soil before planting. “We do not make beds but with the help of machine we make rows. Then transplant the bulbs and draw the drip pipe for watering. We give 25 kgs of 20:100:75 NPK after the bulb sprouts and then give next 25kgs after 4months (flowering time). We do not use anything other than this till the end of the year. Every year we repeat the same fertilizer schedule,” he elucidates the fertilizer plan. Rajanigandha is usually less prone to diseases and pests hence cost of production is low in comparison to other floriculture crops. “Pesticides are sprayed as per the advice of experts from KVK. Nonetheless, the plant seldom gets attacked by the pests as we feed the balanced manure in the soil of 19:19 or 17:17. Later it gets scions just as in onions,” he states. It is a sun loving plant and grows well if it gets proper sunlight and day temperature is close to 30 degrees. The first harvest is obtained in 4-5 months. The flowering period begins from July and August-September is the peak period of flowering. “First day we get 1kg flowers, second day it increases to 1.5kgs and so on. In this way we may get 15kgs per 1.25acres every day,” explains Mr. Adappa. It takes one hour to harvest 10-15kg flowers. Flowers are sold at nearby local flower market. “The price depends on Gadag market. At 10 o’clock, the tender opens and price is decided. The flowers are sold in the wholesale market and payment is credited in the bank accounts once in a week. Usually price drops in off season but it will be high from February till April, close to Rs. 60/kg. We pluck the flowers in the morning, pack in plastic packing and send the produce through bus. It reaches the market in 40 minutes,” says Mr. Adappa. 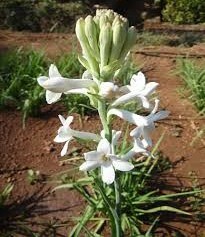 Apart from selling rajanigandha flower, farmer can also earn from this flower plant by selling its spikes and bulbs. The spikes can be used as cattle fodder. Secondly after 2 years from transplantation the bulbs propagate naturally. “One bulb multiplies into 20-30 bulbs that can be sold to other farmers,” he shares. Speaking of growing flowers in polyhouse, “It is true that we get good yield in polyhouse but in our village many farmers who got trained through government programs are cultivating flowers in polyhouse but not getting high yield,” he expresses his concern. In future Mr. Adappa wants to cultivate rajanigandha in 3.5acres. He also wants to make garlands and sell in market to increase the profit margins. Lastly he plans to switch to organic farming for nurturing his fruit trees. “Even with less water I am getting good yield therefore I want to take care of the soil to maintain its fertility,” he signs out.